Hexokinase or glucokinase is an enzyme that convert glucose to glucose 6 phosphate. It is the first step of glycolysis. One ATP molecule is cleaved to ADP and the phosphate released is added to glucose. Hence glucose is converted to glucose 6 phosphate. This enzyme which convert glucose to glucose 6 phosphate exists in two isomer forms. 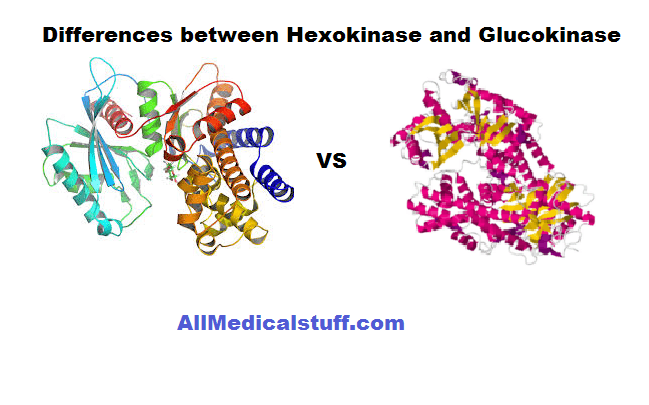 One is called hexokinase and another is called glucokinase. 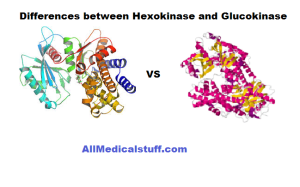 Here are the key differneces between hexokinase and glucokinase. Both of these enzymes are iso enzymes, which means that both of them have the same chemical natures and have same action but have different physical properties and site of action etc. Here are some of the difference between both. Hexokinase is present in all tissues (Except) the liver and B-cells of pancreas whereas, Glucokinase is present in both Liver and B-cells of pancreas. The activity of glucokinase depends upon the nutritional stat of glucose. Means it only becomes active when quantity of glucose is present in liver. While activity of hexokinase doesn’t depends on nutritonal state of glucose. Means hexokinase remains active even at low glucose levels. Glucokinase has a high km value while hexokinase has a low km value. Hexokinase is an allosteric enzyme while glucokinase is not an allosteric enzyme. Hexokinase is not induced by insulin while glucokinase is induced by insulin. Hexokinase feedback is inhibited by glucose 6 phosphate. While glucokinase has no direct feedback inhibition. Hexokinase is present in all all tissues of the of body but glucokinase is present only in liver. Haxokisae remain active all the time but glucokinase is only active when more glucose is present. Hexokinase has low km value while gluxokinase has high. Hexo kinase is allosteric and gluco kinase is not. One is induced by insulin while another is not. One has feedback inhibition while other has not. This is the complete difference between both of these iso enzymes. Both of these catalyze the the same reaction i.e they convert glucose to glucose 6 phosphate. But has the above explained physical differences. Does glucokinase have broad substrate speficity or does it just act on Glucose? its principle substrate is glucose but it also convert ATP to ADP. thanks for your kind words…keep visiting this site. Glucokinase is present in Pancreas also. Deficiency of Glucokinase in Pancreas can lead to one type of maturity onset diabetes which is usually mild. thanks for contributing to this post. Can anyone help me to get expression for hexokinase-2 in semi quantitative PCR. i m using liver cancer cells … tried many times but i dint get any band. were i did the mistake….. CORRECTION: Hexokinase is present in “all tissues (Except) the liver and B-cells of pancreas” whereas, Glucokinase is present in both Liver and B-cells of pancreas. thanks for your contribution. will update my content. good quick article; I didn’t know about these isomers and how deficiency in pancreatic glucokinase can lead to mild diabetes (comment). I believe diabetes is a blanket term for high blood sugar, resulting from factors like insulin resistance, non-expression of insulin etc … leading to ants liking your waste fluids. This article makes me think that there could be a myriad of other particles we haven’t discovered (they’re hard to see) that contribute to glucose metabolism. An ecosystem of less expressed proteins and other factors that is still evolving. i think i have added these points…will add the ones that are not there.